Today, 2.3 million Singaporeans will head to the polls for the 11th general election since independence in 1965. Unlike days past, the outcome of this election is shrouded in uncertainty. SINGAPORE, May 6 (Bernama) -- Singapore electorates are set to cast their ballots Saturday in the republic's general election (GE). Singapore has been under the People's Action Party (PAP) since 1959. In the last general election in 2006, it won 66.6 per cent of the votes and 82 out of 84 parliamentary seats. Singapore - Singapore voters had a chance to cool down Friday before going to the polls this weekend for an election expected to be hotly contested, by the city-state's standards. SINGAPORE, May 5 (Bernama) -- As the campaign in Singapore's 14th General Election enters its final day, leaders of the main political parties are making the final push for votes. The parties are feverishly putting in their last effort on the campaign trail to secure the votes they need, in what some analysts and political observers predict to be the most interesting and closely contested in the history of the island state. 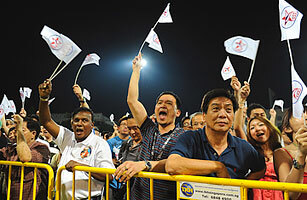 SINGAPORE, May 4 (Bernama) -- Political parties, be it the ruling People's Action Party (PAP) or those from the opposition, are intensifying campaigns, in their quest to win the hearts and minds of Singaporean voters. For this upcoming 14th General Election (GE), there will be a 'cooling-off day' which falls on Friday, a day before the actual polling on May 7.